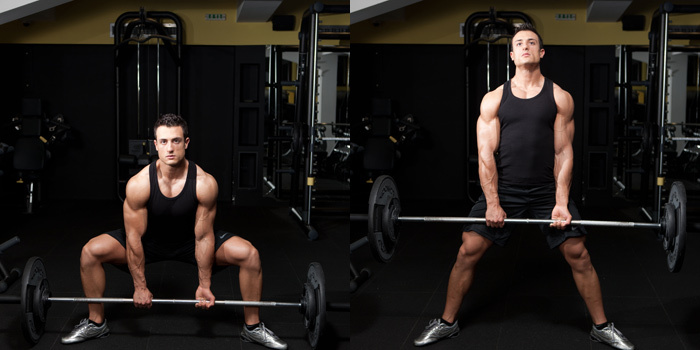 The sumo deadlift is a great variation of the conventionally deadlift. It is popular mainly among the powerlifters and it’s almost impossible to see a regular trainee to perform this movement. Some powerlifters prefer the sumo technique because it shortens the movement and the weight travels a shorter path, which allowing them to lift bigger weights. But to perform the sumo deadlift you have to own good flexibility and strong lower body. For the regular trainers the benefit from the sumo deadlift will be stronger glutes, hamstrings and adductor muscles and increased power in all leg movements. The sumo deadlift is a compound multijoint exercise and train all muscles in the body so it will help you to get stronger and leaner by activating your metabolism. To perform the exercise first set a barbell with desired weight on the ground in front of you. Put your feet under the bar wider than shoulder width apart with your toes pointing out right to the inner plates of the barbell. After you stand in the right position to the bar bend your knees, bend forward, maintaining a straight back and grasp the bar using a closer than a shoulder width apart mixed grip (one hand overhand grip other hand underhand grip). This is the starting position. Take a deep breath and hold it in the stomach. Arch your back and flex your abs to provide back stability and power. Than start lifting the bar by first pushing with your heels at the floor extending your knees and hips as simultaneously getting your torso to the upright position. As the bar passes through the heels stand upright, puff your chest out , pull your shoulder blades together and drive your hips in to the bar. Breathe out at the top. Go back to the starting position by first leaning the torso forward and than when the bar pass your knee cap start bending your knees and hips and squat all the way down as you maintaining a straight back. Keep the bar as close to your body as possible during the movement to improve mechanical leverage and protect your lower back from injury. Keep your head facing forward and maintain a straight back during the entire movement. Keep your arms straight and don’t flex your elbows. Don’t raise your shoulders up during the movement. Don’t bending your knees till the bar pass the knee cap, if you do that you will go further away from the ideal axis of rotation (hips) who will lead to round in the lumbar spine which is not desirable. During the movement the knees should follow the direction of the toes. If you are new at this exercise give yourself enough time to learn the right form and be conservative with the amount of weight used. Don’t use side mirrors to watch yourself during the exercise, this can cost you a neck injury. If you are not sure that you performing the exercise in the right way provide yourself an experienced partner who observe you during the movement and corrects your form.